There are a lot of bald guys in this comic. And by a lot I mean two. Unless some of my characters are secretly wearing rugs or combing their hair forward!! Oh dear…if the Doc wasn’t mentally unstable before this, I have a feeling he will be after. Hang in there, Doc! hmm…. maybe they ARE hiding a few wigs around there somewhere.. Assume every character is bald until you know otherwise!! The langstroms seem to get involved with very interesting people. By the way, I really like how you drew auditore’s face in the last panel so that his glasses interfere with the part of his face behind them. Not enough people do that and it really adds a lot of realism to it. It’s easier to remember to make glasses lenses refract when you wear them yourself, perhaps. Auditore’s prescription must be pretty strong, though. Dang, look at that refraction. They could be prisms- they correct eye weirdness like wandering eye and double vision. I have em, and the refraction is usually pretty crazy. 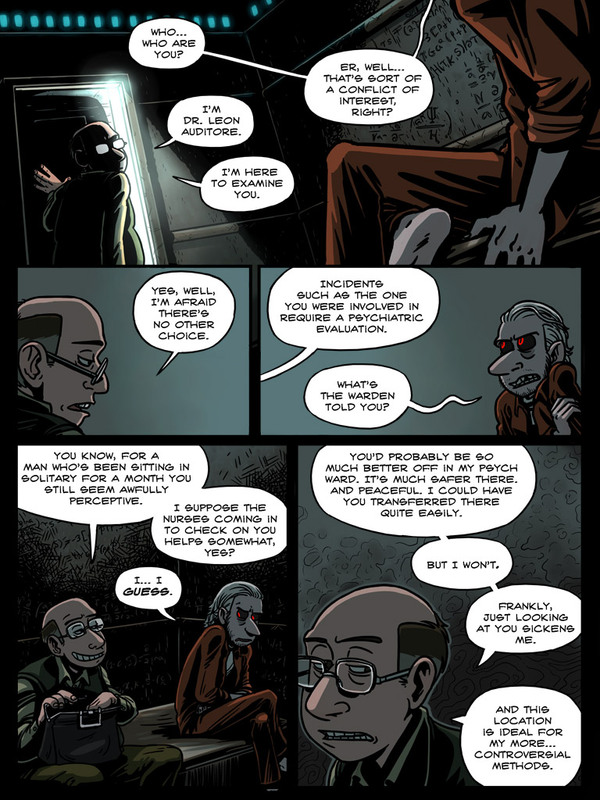 I suspect that this comic is growing more creepy and awesome at an exponential rate. I could make a chart, probably, for the creepy levels through the whole comic. But, I’d have to keep it to myself. I already made one for Dr. Schtein’s mental health! I bet Schtein’s chart is a sharp downward slope. Ah well, I tend to like insane people, and sanity’s overrated anyway. And then again, no one can say Schtein was completely sane to begin with. And since he seems to be a misanthrope anyway, I bet a month in solitary felt a lot better than living within the general prison population. On the other hand, I see they neglected to give them any gloves. The fiends! I don’t recall giving an estimate for when it would be done. I really can’t give one. I have my own personal goals, but I usually keep those to myself. But, no, I don’t know. Sorry. Man, I hope the redo’s are for a book… I really like going back to the beginning of a comic and watching the art improve as I read. Is she related to the one US president which got the world to the current situation? I guess that would indeed be a shameful secret! That’s why we never believe a word you say. hurry up and get some glasses! He can’t see in in colour anyway, the dark suits him better. Quite possibly, if his ayes eyes work very closely to real ones afflicted with Achromatopsia. I have the “opposite” vision problem, Nyctalopia, and while I usually see more hues than the average person, I have problems adapting in changing light, especially when passing from bright places to dark ones. I want to marry that angle on the first panel. Its delicious candy for my eyes. I love Auditore’s expression in the fourth panel. Also Schtein’s body language. As always, can’t wait for the next page. Interested to see where this is going! I don’t like him. He seems evil. And not in a ‘I’m super smart but crazy’ kind of way, but a ‘I like to *bleep* people up for the fun of it’ kind of way. There is absolutely nothing about this page I didn’t like. Except the fact that I had to describe it using a double negative. It was worth it, though. I am genuinely terrified on Sctein’s behalf. This comic is fantastic. I really hope this doesn’t turn out so bad. Psychologists who mess around with potentially harming patients really disgust me. Amazing drawing in that final panel. W-O-W.
Man, that room just looks full of moldy stuff. Also if Delia also ends up to be bald, can I be the one to say, “I CALLED IT?” I need to know so I can start ordering confetti and pointing-fingers-at-a-crowd lessons. Oh man, so lemme get this straight: this is the story of how Dr Schtein became an evil supervillain… (hopefully a smarter one)… so this is where the “Human Centipede” section begins, scarring the Doc’s psyche for live and yet another step towards him living in a lab in a cave under a volcano cursing do-gooders. I hope he at least gets minions in the end. When I first read this, I misread the order of the first Panel, So I thought that Schtein was making a Godfather joke. Then I remembered that the guy in that was named “Montoya”, not “Auditore”, and that the italian I was thinking of was “Ezio Auditore de Fireze” from Assassin’s Creed 2. So anyway, I will now be imagining Mr. Auditore with a ridiculously thick Italian accent. This convo reminds me of Master Roshi and Krillin. Also something tells me memories of Schtein’s mom are about to be resurfaced! I sense Bad Things coming. damn, Mr. Auditore, you are an awful lot of douche. highlarious though.